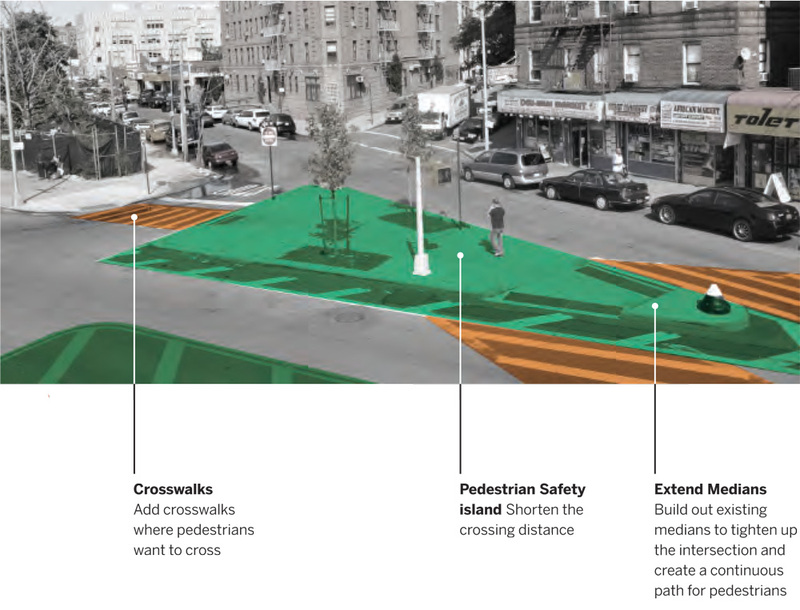 Better street design can dramatically improve safety for everyone. 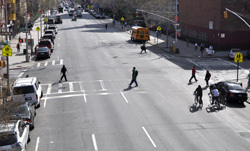 Vision Zero requires that New York City redesign its streets and intersections to improve safety — drawing upon worldwide best practices in roadway improvement and regulation strategies. The City needs more of these projects to protect families from every walk of life in neighborhoods across all five boroughs. These improvements are happening already – and they are working. At locations where the Department of Transportation (DOT) has made major engineering changes since 2005, fatalities have decreased by 34%, twice the rate of improvement at other locations. 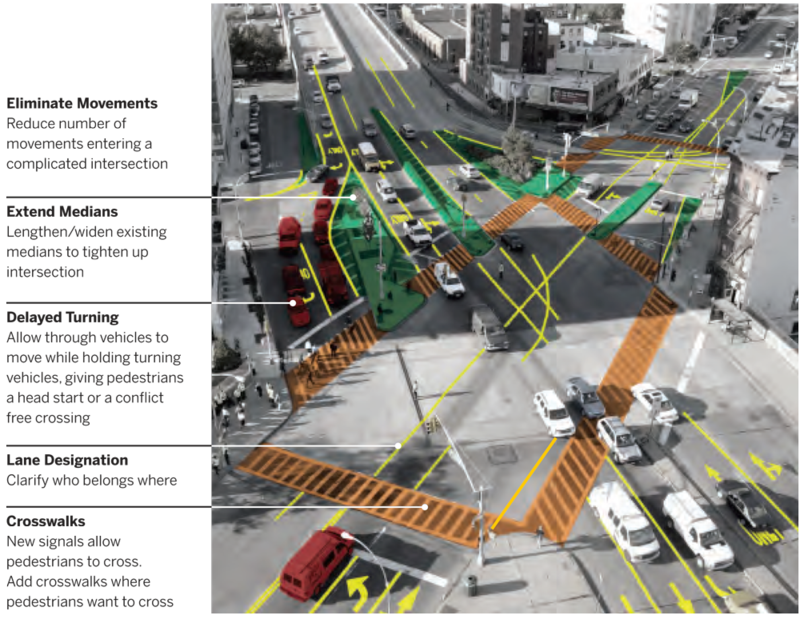 Many projects combine several tools or approaches, including changes to signals, street geometry and markings and regulations that govern actions like turning and parking. These projects simplify driving, walking and bicycling, increase predictability, improve visibility and reduce conflicts. Where DOT has made changes, fatalities are down 34%. 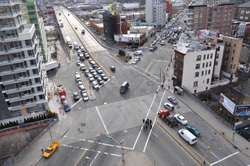 DOT will meet Mayor de Blasio’s goal of carrying out safety improvements at 50 corridors and intersections per year. DOT is also working to expand its safety toolbox. DOT will apply new traffic signal strategies to reduce speeding and intersection conflicts, install new signals where they can allow speed control via coordinated arterial signal timing, add to street lighting at key intersections and improve the visibility of traffic signals. An accelerated speed bump program will allow DOT to respond to individual neighborhood or community requests, meet a recently passed law requiring 50 new speed bumps per year at school locations and implement eight neighborhood slow zones per year. 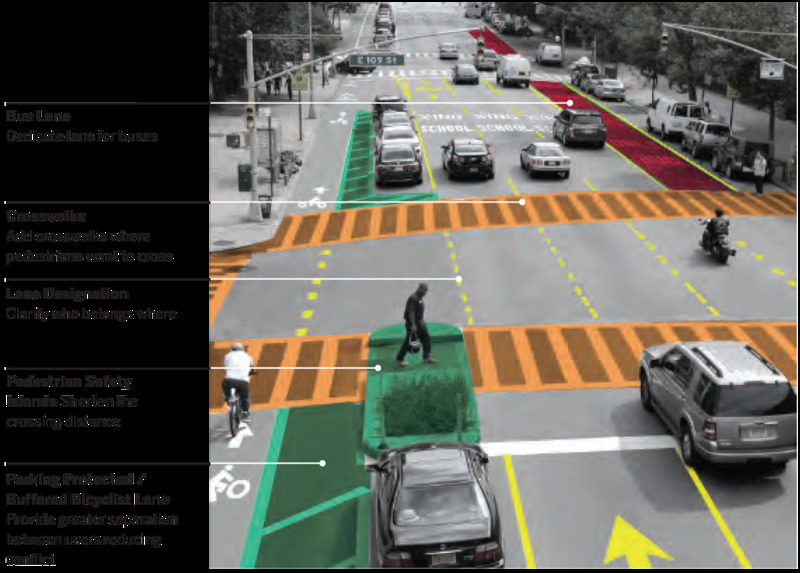 In addition, DOT will also augment its efforts to maintain street markings – because clearer markings improve safety. Additionally, DOT will launch a global best practices study in an effort to bring new tools to bear in the City’s effort to become the safest big city in the world. A combination of new high visibility crosswalks, reduced crossing distances, turn restrictions, leading pedestrian intervals, extended medians and clearer lane designations eliminated 63% of all injury crashes at one intersection. On Macombs Road, redesign led to 41% fewer crashes with injuries.